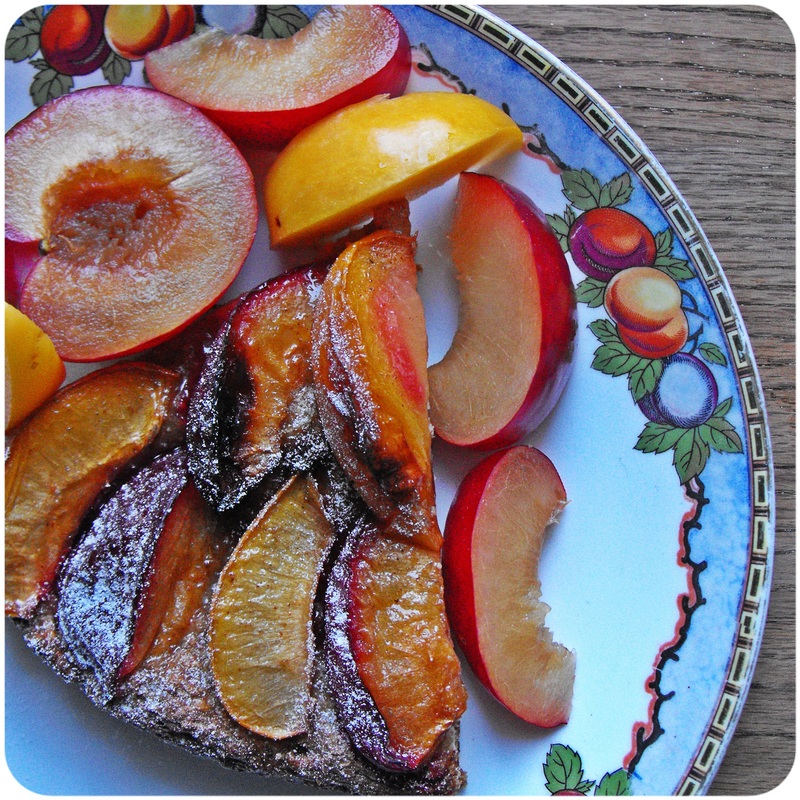 Whole grain Pflaumenkuchen- yeasted plum cake. This right here is one of the luscious hybrids of bread and dessert that exist in the world. The juicy tart plums are tamed by a delightful sweetened whole grain dough and a delicate dusting of confectioners sugar. It’s well worth the time spent waiting for it to rise, perfect all year round, delicious cold with whipped coconut cream or hot with spice stewed plums and vegan vanilla ice cream. I only wish I had made this sooner! You can also top this with fruit to match your season and use white bread flour, or spelt, though I would recommend cutting down the amount of liquid as the whole grain flours used in this recipe require more water than spelt or white flour. Gently heat the vegan margarine and milk together in a saucepan on a low heat until the margarine has melted, allow to cool until tepid/lukewarm, then whisk in 1 tsp of your dried yeast. Now add the orange zest to the liquid. Whisk the dry ingredients, and the other tsp yeast, together in a mixing bowl. Make a well in the center of your dry ingredients and pour in the wet, mix well for a few minutes, until it comes together and then need for about 5-8 minutes, because the dough will be wet you need to use the “pull and fold” method for kneading until the dough is worked together enough to knead properly. To do this pull the dough from the edge and fold it over its self. Repeat until it becomes a workable dough the knead until elastic and place in a lightly oiled bowl and cover with cling film. Leave in a warm place to rise for about 1 hour or until doubled in size. Once the dough has doubled in size, grease a 9″ round spring form cake tin and press the dough into the base with the tips of your fingers. Preheat the oven to 180c/360f. Stir together the cinnamon, nutmeg and golden caster sugar and sprinkle half the mix onto the dough, then arrange the plum segments on the dough and sprinkle the remaining sugar mix on top. Allow to rise up again for another 30 minutes then bake for about 35-40 minutes until the plums are just starting to brown and the dough is turning dark brown around the edges. Whisk together the syrup and the warm water and pour the glaze over the bread/cake as soon as it comes out of the oven, allow to cool in the tin before taking out, slicing and lightly dusting with icing sugar. 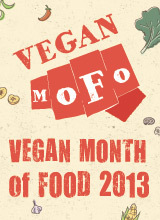 This entry was posted in Breads, sweet treats and tagged bread, dessert, food, plums, vegan. Bookmark the permalink. This looks spectacular! 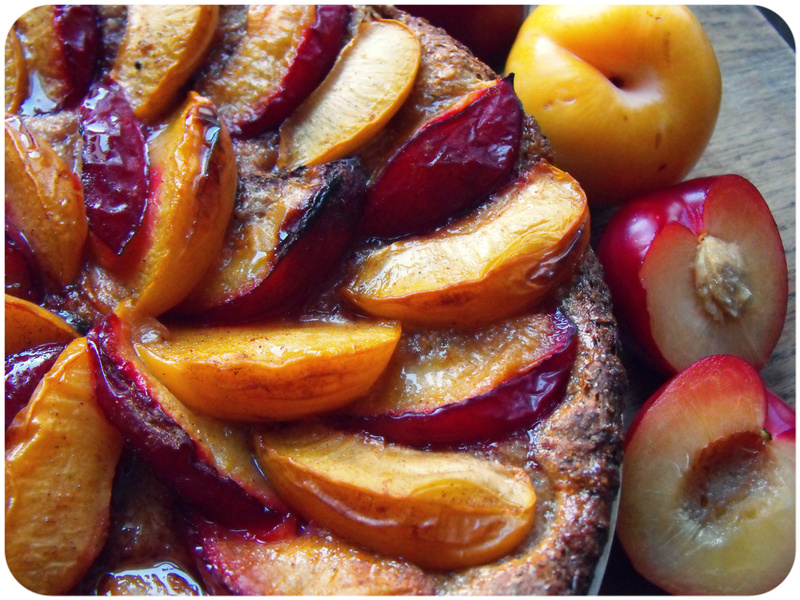 I could use nectarines or peaches instead of plums, as they are both in season here. I would like to try making it with spelt flour. Nectarines would be lush! Ive got some rhubarb in the garden that will be ready soon and im gonna try it with that, and maybe try a ginger and pear topping, hope the recipe works out for you! Oh ginger and pear sounds scrumptious too! Lucky you, having rhubarb in the garden. Rhubarb grows really well in my area. Lots of people grow it and it is really cheap to buy at our farmers’ markets. That’s probably why I have never grown any! I have a plum tree in my garden but sadly its not in fruit yet, im going to try it with rhubarb. I hope you enjoy the recipe! 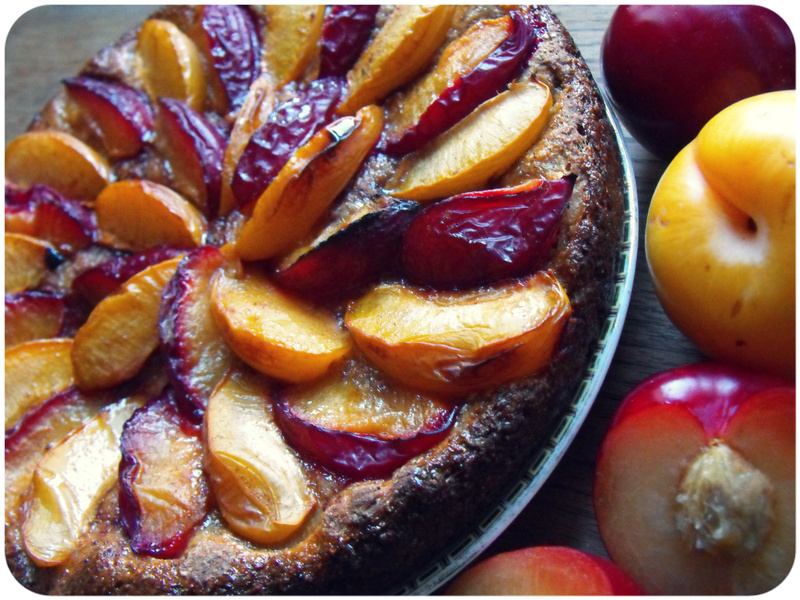 It’s hard to find anything prettier than plums baked into a cake. Perfect! I made a similar recipe like this one but not a vegan one! Finally, you have made a fabulous vegan one! I can’t wait to try this tasty sounding & looking recipe! A real winner too! 🙂 MMMMMMMMMMMMMMMM! We just made it with California plumcots (plum apricot hybrids). The top was lusciously sinful. Interior a bit dry. Can we add walnuts and raisins?